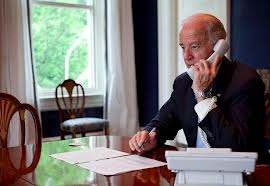 Looks like Vice President Biden was not too good to make a phone call regarding NSA leaker Edward Snowden. Correa said he had a “friendly and very cordial” conversation with Biden, and told the vice president that Ecuador hadn’t sought to be put in the situation of deciding whether to harbor an American justice-dodger. He said Ecuador can’t consider the asylum request until Snowden is on Ecuadorean soil. The question that needs to be asked Biden by Wh reporters is whether Snowden is a big “F’n” deal? Biden – Am I the 100th caller? Oh President Rafael Correa, how are you? Vice President Joe Biden has asked Ecuador to turn down an asylum request from National Security Agency leaker Edward Snowden, the country’s president said Saturday. Rafael Correa, in a weekly television address, offered little sympathy for the Obama administration’s view that Snowden is a criminal who should be swiftly returned to the U.S. At the same time, he vowed to seek American input on any asylum request and suggested Snowden will have to answer for his actions. Basically, Obama knows that Ecuador is going to tell the United States to pound sand when it comes the the extradition of Edward Snowden, so Obama would rather throw Biden under the bus than provide any form of leadership himself. I guess Obama will learn what happens when the media reports it.